The 2019 WSLEFIA summer conference will be The 9th of July through the 12th of July. The hotel for the armorer classes, membership meeting, lecture, and vendor displays will be the Holiday Inn Express, located at 4525 Convention Place in Pasco, Washington. They have been contracted to provide goverment rate rooms of the first 40 participants to register. Use the code "FIA" to get the discount online. 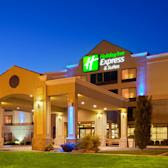 Official site of Holiday Inn Express & Suites Pasco-TriCities. Stay Smart, rest, and recharge at Holiday Inn Express - Best Price Guarantee. The live fire portion of the conference will take place at the Rattlesnake Mountain Shooting facility located in Benton City, Washington, 8 miles Northwest of Richland, Washington on State Route 240. Use the coordinates 46.3522300, -119.4608330 to navigate to the gate. July 8th, 10am, Range clean and set up. Please join us at the range to get set up! 6pm, General Membership Meeting and Course Sign up. July 10th Larry Hann will provide a precision rifle class on the 1000 yard range in the morning. He will have a patrol rifle class in the afternoon. July 10th, 11th, and 12th Rob Boothe will be teaching a carbine class on the range. July 10th, 11th, and 12th Jeff Hall will be teaching a pistol shooter analysis class on the range. July 10th, 11th, and 12th Gary Drake will be teaching on the range. July 10th, 11th, and 12th Jason Paletta will be teaching a class about shooting around vehicles on the range. July 12th, Bill Robnett will teach everything you need to know about supressors. With this lineup of instructors, this is a training you do not want to miss! You May now pay your membership dues ($30), and/or Conference registration ($200). Use the secure "On Line Store" link in the Member Resources section (it is on the left side of this article) of the website.